Growing older doesn't mean you have to grow old. By combining good lifestyle choices with a great attitude--and utilising the benefits of modern cosmetic medicine--we can Grow Younger and More Beautiful, with every year that passes. Dr Catherine Stone--affectionately known as Dr ... read full description below. Growing older doesn't mean you have to grow old. By combining good lifestyle choices with a great attitude--and utilising the benefits of modern cosmetic medicine--we can Grow Younger and More Beautiful, with every year that passes. Dr Catherine Stone--affectionately known as Dr Cat--is an internationally recognised authority in cosmetic medicine, with a passion for positive ageing. She is known as an industry innovator and has been featured as one of the Ultimate Top One Hundred Global Aesthetic Practitioners. 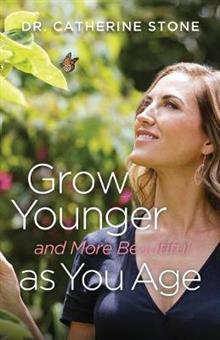 In this guidebook, she shares her tips and tricks--from simple daily choices to reduce stress, increase energy, and improve your health, through to a comprehensive yet accessible guide to the most popular and effective non-surgical cosmetic procedures, as well as her philosophies on ageing beautifully inside and out.